Get up out of your chair and into the city streets with gaming that has been brought from the screen into real life. The MapAttack! 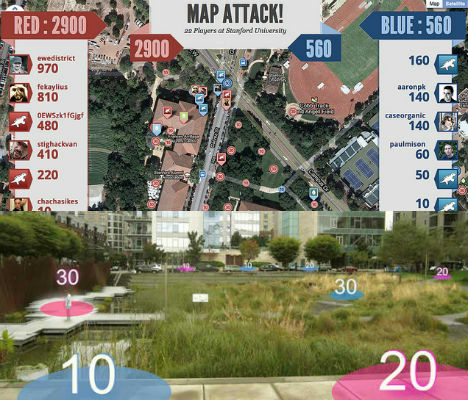 smartphone app for Android phones and iPhones can turn any neighborhood or park into a virtual game board for four to twenty players, encouraging exploration of urban environments. 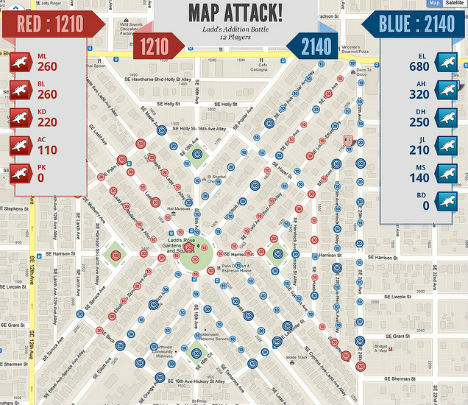 Inspired by a real-life version of Pac-Man called Pacmanhattan, Geoloqi’s MapAttack pits two teams against each other with the goal of capturing the most digital points on the game board. 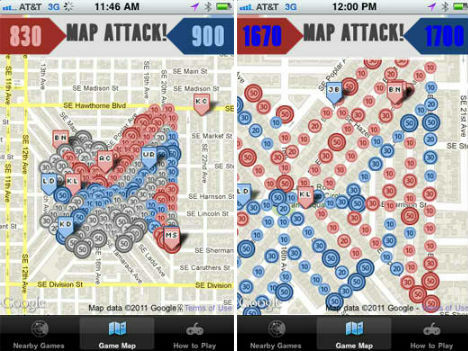 Using their phones as maps, players have to physically reach each colored dot to score points. As points are captured, players’ phones are updated to reflect the real-time score. Game sessions last between 20 minutes to 1.5 hours depending on the number of players and the size of the game board, i.e. the area that you choose to play in. Techies interested in the technology used to create the app can take a peek at the source code on the MapAttack website. Based in Portland, Oregon, MapAttack developer Geoloqi is a platform for real-time location-based services providing toolkits for tracking, messaging, battery management, geofencing, storage and other functions for mobile developers.